Expected or not, Google’s move to unleash Android 3.2 along with reworked SDK tools is certainly a pleasant revelation for tablet enthusiasts and developers. The updated version of Honeycomb should keep fans interested while the company rolls up their sleeves and prepares to launch Ice Cream Sandwich in this half of the year. Listed on top among the major enhancements are the system optimizations for a wider variety of slates, meaning the full power of Android ought to reach even more devices running the OS. Next in line is media sync from SD cards on tablets which support removable SD cards. So users will finally be able to load media files right from the SD card to apps employing them. On the developer front, the platform’s screen support API extends better control over the UI on a range of Honeycomb devices with new-fangled resource qualifiers and manifest attributes. ‘Today we are announcing the Android 3.2 platform, an incremental release that adds several new capabilities for users and developers. The new platform includes API changes and the API level is 13,’ says a post on the official Android Developers blog. Also of interest to regular users should be the compatibility display mode. 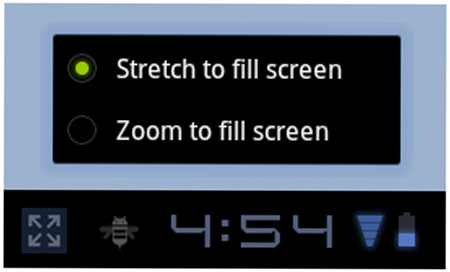 It renders a new way to view fixed-sized applications on larger screens. For such apps, this mode throws them up as pixel-scaled alternatives as opposed to going for the standard UI stretching. Well, Xoom users should be cheering if Motorola is indeed rolling out Android 3.2 for the slate as reported by CNET News recently.